We had a fantastic turnout representing all part of the country, with a total exceeding 12,500 votes submitted through our poll and from emails. It was a close race between the top 5 trucks throughout the time the poll was running. The leads changed numerous times, and it wasn’t until we tallied and combined all of the votes that we actually knew who the 2012 winner was. Mobile Cuisine is proud to announce the 2012 Rookie Food Truck of the Year winner. With just over 19% percent of the overall vote (just 0.4 percent votes over second place) Crazy Good Burgers from Morristown, TN has claimed the title. 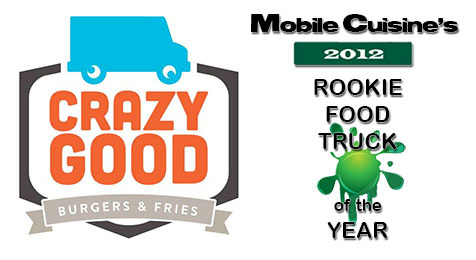 We would like to congratulate the crew from Crazy Good Burgers and thank our readers for helping us with this poll. We will be providing a feature article on this truck soon.